Dark in color with a nice smooth black cherry nose. On the mid palate the wine is a spot on Cali cab with lots of lovely black cherries coming through. Not super fruity, not too sweet, just right. On the medium length finish the wine displays some nice smooth tannins and acidity. A super food friendly wine. I paired it with pan fried veal in a mushroom sauce and it went well. I would give it an 88-89. I had it off the by glass menu at Lord Nelson’s in Burlington. Not in the LCBO sadly. 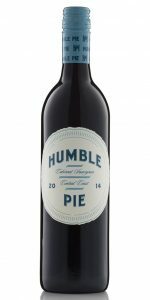 The 2014 Humble Pie Cabernet hails from four vineyards in the Central Coast growing region. The majority of the grapes come from Hames Valley, which is known for being one of the warmer regions in the Central Coast, and the San Lucas appellation which has the highest diurnal temperature variations of any appellation in California. WINEMAKING: The shale-and-loam soil, plus the above-average temperature in Hames Valley and San Lucas for the Central Coast, leads to a perfect growing region for this 100% cabernet. Our grapes were picked early in the morning before the rains came in late October. After being picked, the grapes were immediately sent to the winery where the wine was slowly fermented at a cool temperature and aged on French Oak for 10 months. TASTING NOTES: Initial aromas are black currant, cherry, vanilla, white pepper and strawberry rise from the glass. Humble Pie has a wonderful acidity which carries flavors of black currant, vanilla bean, cedarwood and a hint of cigar. FOOD PAIRINGS: Humble Pie is a perfect stand-alone wine; it will also pair well with hearty meat dishes and wild game. This entry was posted in American, Wine. Bookmark the permalink.